Jun kinase signaling can be elicited by death receptor activation, but the mechanism and significance of this event are still unclear. It has been reported that cross-linking Abs to Fas trigger c-Jun N-terminal kinase (JNK) signaling via caspase-mediated activation of MEKK1 (JNK kinase kinase), elevation of ceramide levels or by recruitment of death domain associated protein (DAXX) to Fas. The effect of physiological ligand for Fas on JNK signaling was never investigated, although evidence is accumulating that Fas ligand is able to induce cellular responses distinct from those evoked by Ab-mediated cross-linking of Fas. Therefore, we investigated the effect of Fas ligand on JNK signaling. Like its ability to induce cell death, Fas ligand reliably activated JNK only upon extensive aggregation of the receptor. Although this was partially dependent on caspase activation, DAXX was not required. DAXX and other death receptor-associated proteins, which have been reported to bind directly or indirectly to Fas, such as receptor interacting protein (RIP) and RIP-associated ICH-1/CED-3-homologous protein with a death domain (RAIDD), were shown to be dispensable for Fas ligand-induced apoptosis. Oxidative stress, osmotic shock, UV or gamma irradiation, and ligation of cytokine receptors can all stimulate the stress-activated kinases p38 mitogen-activated protein kinase (MAPK)3 and c-Jun NH2-terminal kinases (JNK). In turn, these kinases can activate several transcription factors, such as c-Jun, ATF-2, or MEF-2, by serine phosphorylation within their transcriptional trans-activation domains. However, it has also been reported that stress-activated kinases can attenuate the activity of other transcription factors, such as NF-AT4 (1, 2). Conflicting results have been published regarding the role of JNK signaling in the control of apoptotic cell death (3, 4, 5). Overexpression of certain components of the JNK signaling pathway were shown to induce apoptosis in Jurkat T lymphoma cells or fibroblasts, and dominant negative (DN) mutants of these proteins were reported to block UV irradiation or cisplatin-induced killing of these cells (6, 7, 8). However, the requirement of JNK signaling in drug-induced cell death does not seem to be a general one (9). Ligation of the death receptors Fas (also called APO-1 or CD95), TNF-R1, DR3, DR4, DR5, or DR6 leads to activation of the JNK pathway in many cell types (1, 5, 10, 11, 12, 13). In the case of Fas, many mechanisms have been reported to lead to JNK activation. One mechanism involves caspase cleavage-mediated activation of MEKK1, a JNK kinase kinase, that can activate the JNK upstream regulators SEK1/MKK4 and MKK7 (14). Elevation of ceramide levels in response to Fas cross-linking was also reported to activate JNK, but this has been challenged (3, 15, 16, 17). Fas was reported to engage the JNK pathway via death domain associated protein (DAXX)-mediated activation of ASK1/MKK5 (18, 19). Overexpressed DAXX was shown to interact with the death domain (DD) in Fas and to potentiate anti-Fas Ab-induced apoptosis and JNK activation in 293 and HeLa cells. The C-terminal fragment of DAXX (aa 628–739) was reported to be sufficient for Fas binding and to act as a dominant interfering mutant, inhibiting Fas-induced apoptosis and JNK activation (18). The DD in Fas has also been reported to undergo homotypic interaction with the DD of receptor interacting protein (RIP) kinase (20). RIP, in turn, binds the adapter molecule RIP-associated ICH-1/CED-3-homologous protein with a death domain (RAIDD) to recruit and activate caspase-2 zymogens via homotypic interaction of their caspase recruitment domain (CARD) (21). RIP can also bind to the TNF-R1 downstream effector TNF-receptor associated factor 2 (TRAF-2) (22). TRAF-2 deficient cells are unable to induce JNK in response to TNF, but are normally sensitive to anti-Fas Abs and hypersensitive to TNF, indicating that JNK activation is dispensable for death receptor-transduced apoptosis (23, 24). The question of whether JNK signaling is a consequence of activating the death program or is an independent event is still unclear. In Jurkat T lymphoma cells, application of the broad spectrum caspase inhibitor zVADfmk inhibited Fas-induced apoptosis and JNK activation at low concentrations of anti-Fas Ab, but failed to block JNK activation when higher concentrations of this Ab were used (25). However, other investigators demonstrated that zVADfmk effectively inhibited JNK activation in the same cell type at even higher concentrations of anti-Fas Ab (26), suggesting that caspase activity is a prerequisite for Fas-mediated JNK activation. In contrast, in neuroblastoma cells and 293 human embryonic kidney fibroblasts, Fas-induced JNK activation was unaffected by zVADfmk treatment (5, 18, 19). Mice lacking distinct components of the JNK signaling cascade have been analyzed to investigate its role in cell death control. Hippocampal neurons from JNK3−/− animals were protected from kainic acid-induced cell death and seizures, and immature CD4+8+ thymocytes from JNK2−/− animals were reported to have increased resistance to TCR/CD3 activation-induced cell death (AICD) (27, 28). Mice lacking JNK1 had elevated numbers of Th 1 cells, which were also abnormally resistant to AICD (29). Thymocytes of both strains of mutant mice were normally sensitive to Fas-induced apoptosis. AICD requires Fas and Fas ligand (FasL) (30). It therefore appears that JNK1 and JNK2 are not needed for Fas signaling, but play a role in FasL expression. The latter has been confirmed by several studies of the promoter of the FasL gene (31, 32). In contrast to these results, it has been reported that in animals lacking the JNK upstream regulator, MKK4/SEK1, thymocytes showed enhanced sensitivity to Fas-mediated cell death (33), but this has been challenged (34, 35). To date, all these studies took advantage of cross-linking Abs to Fas. This may have produced misleading results, since it has been documented that anti-Fas Abs do not perfectly mimic the physiological ligand of Fas (36). We investigated the impact of soluble, cross-linked, or membrane-bound FasL on JNK activation and cell death in the lymphoid cell lines, CEM and SKW6. Furthermore, we analyzed the dependence of FasL-mediated JNK activation on caspases and the intracellular protein DAXX by analyzing cell lines stably expressing dominant inhibitors of these proteins. We also investigated the role of the signal transducers DAXX, RIP, and RAIDD in FasL-induced apoptosis in these lymphoid cells. Our results demonstrate that cross-linked or membrane-bound, but not soluble FasL induces JNK activity and apoptosis, suggesting that aggregation of many Fas receptors is necessary to induce these events. While Fas-induced apoptosis required caspase activity, FasL-mediated JNK activation was only partially dependent on caspases and was completely independent of DAXX. Furthermore, Fas-mediated apoptosis in lymphoid cells does not require DAXX, RIP, or RAIDD, which have been proposed to play a role in Fas-induced cell death. CEM and Jurkat human T acute leukemia-derived lines and the human B lymphoblastoid SKW-6 as well as the mouse B lymphoma cell line CH1 were used in this investigation. Neuro2A neuroblastoma cells and a derivative clone transfected with a murine FasL expression construct have been described (36). CEM and Jurkat cells were cultured in RPMI 1640 medium, and Neuro2A, SKW6, and CH1 cells were cultured in the high glucose version of DMEM, both supplemented with 10% (v/v) heat-inactivated FCS (TRACE Bioscience Castle Hill, NSW, Australia), 250 μM l-asparagine (Sigma, St. Louis, MO), 50 μM 2-ME (Sigma), and 100 μg/ml penicillin/streptomycin (Life Technologies, Gaithersburg, MD) at 37°C in a humidified atmosphere containing 10% CO2. Expression vectors for dominant interfering mutants of DAXX, RIP, or RAIDD were generated by PCR amplification of aa 628–739 of mouse DAXX, aa 120–199 of human RAIDD, and aa 5–553 of mouse RIP. The products were subcloned into pEF-based expression vectors incorporating N-terminal EE- (37), FLAG- (Sigma), or I-SPY-epitope tags (38). PCR was performed using proof-reading Pfu Turbo DNA polymerase (Stratagene, La Jolla, CA), and the sequences of all constructs were verified by automated sequencing (ABI Perkin-Elmer, Foster City, CA). Cells were transfected by electroporation, and drugs for selection of transfectants (3–10 μg/ml puromycin, 0.5–2 mg/ml neomycin or hygromycin) were added after 36 h of culture. Drug-resistant lines were cloned with the single-cell deposition unit of the FACStarPlus cell sorter (Becton Dickinson, Mountain View, CA). The expression construct for FLAG-tagged CrmA and FADD-DN have been described (39, 40). Cells (1–2 × 106/ml) were resuspended in 50 μl of lysis buffer (50 mM Tris, 150 mM NaCl, 2 mM EDTA, and 1 mM EGTA, pH 7.5, supplemented with 1 mM Na3VO4; 1 mM NaF; 25 μg/ml aprotinin, leupeptin, and pepstatin; Pefabloc; and 1% Triton X-100). Samples were cleared by centrifugation (16,000 × g, 5 min, 4°C). Proteins were size fractionated by SDS-PAGE (14%) under reducing conditions in Tris/glycine-buffered gels (NOVEX, San Diego, CA) and transferred onto polyvinyl-difluoridon membranes (Millipore, Bedford, MA) by electroblotting. Membranes were blocked for >12 h in PBS containing 0.05% Tween-20 and 5% skim milk at 4°C. The anti-phospho-Jun kinase mAb G-9 (New England Biolabs, Beverley, MA) was diluted 1/2000 in PBS containing 0.05% Tween-20 and 5% skim milk for immunolabeling. Peroxidase-conjugated rabbit anti-mouse Ig Abs (Silenus, Paris, France) served as secondary reagent (1/1000), and the ECL chemiluminescence system (Amersham, Arlington Heights, IL) was used for detection. Membranes were reprobed with polyclonal rabbit antiserum sc-571 specific for JNK1 and JNK2 (Santa Cruz Biotechnology, Santa Cruz, CA) to demonstrate equal protein loading of the gel. Mouse anti-human FADD mAb (PharMingen, San Diego, CA), mouse anti-human caspase-8 mAb (PharMingen), and rabbit anti-human caspase-3 antiserum (PharMingen) were diluted 1/1000 in PBS containing 0.05% Tween-20 and 5% skim milk. Anti-human 70-kDa heat shock protein mAb was a gift from R. Anderson (Peter MacCallum Cancer Research Institute, Melbourne, Australia) and was used at 0.1 μg/ml in PBS containing 0.05% Tween-20 and 5% skim milk to demonstrate equal protein loading of the gel. Detection of FLAG-CrmA, B-tag RAIDD-DN, EE-RIP-DN, FLAG-FADD-DN, or EE-DAXX-DN proteins in cells was performed by cytoplasmic immunofluorescence staining (39). Cells (0.2 × 106) were washed in PBS, resuspended, and fixed for 10 min at room temperature in 1 ml 1% paraformaldehyde in PBS. After washing with PBS, cells were resuspended in FACS buffer (balanced salt solution, 2% FCS, 10 mM sodium azide, and 0.3% saponin) containing anti-FLAG M2 (Sigma), anti-I-SPY (Silenus), or anti-EE mAbs (Babco, Richmond, CA; 1/1000). After 30-min incubation on ice, cells were washed in FACS buffer containing 0.03% saponin (Sigma) and incubated with FITC-labeled goat anti-mouse Ig Ab (1/100 in FACS buffer containing 0.3% saponin) for 30 min on ice. After a final wash, the cells were resuspended in 200 μl of FACS buffer, and 5000 cells/sample were analyzed on a FACScan (Becton Dickinson). Parental cells stained with the relevant epitope tag-specific Abs and the secondary FITC-coupled Ab served as negative controls. The percentage of viable cells in culture was determined by staining cells with 2 μg/ml propidium iodide or annexin V-FITC (Roche, Indianapolis, IN), used at the manufacturer’s recommended concentrations, and analyzing the samples on a FACScan. As cell death-inducing stimuli for in vitro studies we used membrane-anchored mouse FasL (coculture with Neuro2A FasL cells), 100 ng/ml FLAG-tagged recombinant human FasL (41), 100 ng/ml JO2 anti-mouse Fas mAb (PharMingen), or 100 ng/ml anti-human Fas mAb APO-1 (42) and 50 μg/ml of the topoisomerase inhibitor VP-16 (Sigma). Recombinant FasL was aggregated by addition of 0.5 μg/ml monoclonal anti-FLAG M2 Ab. Abs to Fas were cross-linked by 100 ng/ml protein A (Amersham Pharmacia, Piscataway, NJ). Application of the cross-linking anti-human Fas Ab CH11 was shown to induce activation of JNK in several cell lines, but the effect of the physiological ligand, FasL, was never tested. We treated human T lymphoma-derived CEM cells and human B lymphoblastoid SKW6 cells with graded concentrations of recombinant FasL (1, 10, and 100 ng/ml) and determined JNK activity after 90 min using a phospho-JNK-specific Ab. Soluble FasL did not induce JNK activity, while application of the cytotoxic drug VP-16 did so in both cell lines (Fig. 1⇓a). However, when an anti-FLAG M2 mAb was used to cross-link recombinant FasL, activation of JNK was readily observed in both CEM and SKW6 cells (Fig. 1⇓b). Similarly, the anti-Fas Ab APO-1 induced JNK activity most efficiently when aggregated by addition of protein A (Fig. 1⇓b). As previously reported (36), cell death in CEM cells was only observed when FasL or anti-APO-1 mAb were cross-linked, but not by application of FasL or APO-1 mAb alone (Fig. 1⇓c). In SKW6 cells, induction of apoptosis required aggregated FasL, but could also be mediated by APO-1 mAb alone (Fig. 1⇓c). Coculture with Neuro2A cells, which were engineered to express membrane-bound FasL, but not with Neuro 2A cells transfected with a control vector, rapidly induced JNK activity and apoptosis in CEM cells (Fig. 1⇓, d and e). These results demonstrate that, as for cell death, aggregation of many Fas receptors is required to induce JNK activation in lymphoid cells. FasL-mediated JNK activation requires receptor multimerization. a, CEM and SKW6 cells were treated for 90 min with graded concentrations of FasL or the topoisomerase inhibitor VP-16 or were left untreated. JNK activity was determined by immunoblotting of cell extracts using an Ab specific for phosphorylated JNK1 and JNK2. Equal protein loading was confirmed by reprobing membranes with an Ab recognizing JNK1 and JNK2. b, CEM and SKW6 cells were stimulated for the indicated periods with FasL, FasL cross-linked with anti-FLAG M2 mAb, APO-1, or APO-1 mAb cross-linked with protein A. Lysates were analyzed for JNK activity by immunoblotting as described above. c, Cell death induced by FasL with or without anti-FLAG M2 mAb or APO-1 mAb with or without protein A was assessed by propidium iodide staining and FACS analysis after 6 h. The mean ± SD of two independent experiments performed in duplicate are shown. d, CEM cells were cocultured with adherent Neuro2A cells expressing membrane-bound FasL or with control Neuro2A cells. Cell cultures were analyzed for cell death (d), and cell extracts were analyzed for JNK activity (e) as described above. To investigate whether FasL-mediated JNK activation requires caspase activity we used CEM cells and SKW6 cells stably expressing CrmA, an inhibitor of caspase-8, or pretreated parental cells with the pan-caspase inhibitor zVADfmk (100 μM) for 30 min before application of FasL. Expression of CrmA was confirmed by cytoplasmic immunofluorescence staining of the cell lines and immunoblotting of cell lysates using FLAG epitope tag-specific Abs (Fig. 2⇓a). FasL-induced JNK activation involves caspase-dependent and independent mechanisms. a, CEM and SKW6 cells transfected with a FLAG-CrmA vector were analyzed for FLAG-CrmA expression by immunofluorescence staining and flow cytometric analysis of fixed, permeabilized cells. Control staining of parental cells is shown by the dotted histograms. Inserts show FLAG-CrmA expression by immunoblotting using FLAG epitope tag-specific Abs. b, Parental and CrmA-expressing CEM and SKW6 cells were treated with cross-linked FasL, and cell extracts were analyzed for JNK activity by immunoblotting as described in Fig. 1⇑a. c, CrmA-expressing CEM and SKW6 cells were treated with cross-linked FasL or cross-linked APO-1 mAb and monitored for JNK activity. Equal protein loading was confirmed by reprobing membranes with an Ab specific for JNK1 and JNK2. d, Parental CEM and SKW6 cells were treated with cross-linked FasL in the presence or the absence of the pan-caspase inhibitor zVADfmk (100 μM) and were monitored for JNK activity. Equal protein loading was confirmed by reprobing membranes with an Ab specific for JNK1 and JNK2. e, Comparison of levels of FADD, pro-caspase-8, and pro-caspase-3 expression in CEM and SKW6 cells. As a control, the membrane was probed with anti-heat shock protein (70 kDa) mAb. f, FasL-induced pro-caspase-3 processing is effectively prevented by preincubation of CEM or SKW6 cells with zVADfmk (100 μM). g, Analysis of JNK activity in extracts from parental CEM and SKW6 cells treated with VP-16 (50 μg/ml) in the presence or the absence of zVADfmk (100 μM). 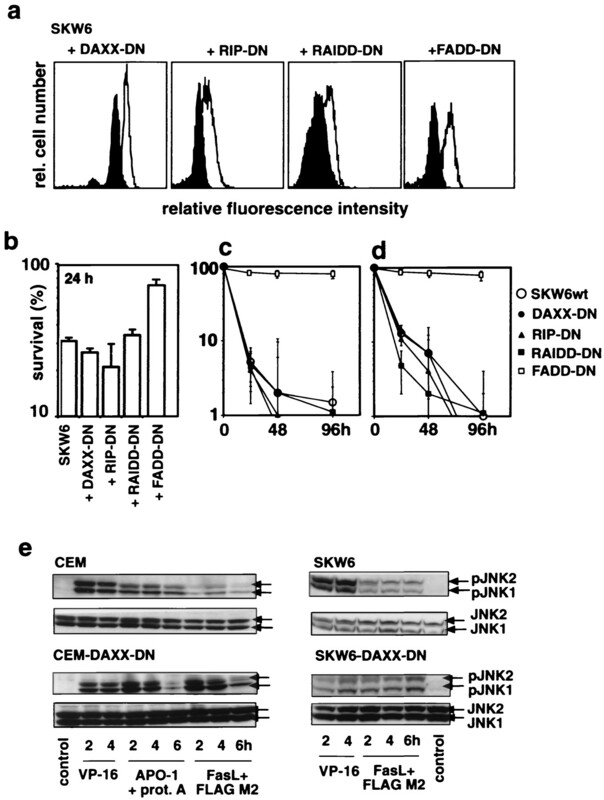 CrmA expression inhibited FasL-induced JNK activation in CEM and SKW6 cells (Fig. 2⇑b). However, longer exposure of filters revealed that JNK activation became apparent in CrmA-expressing cells treated with cross-linked FasL or APO-1 mAb, although to a much lower extent compared with that in parental cells (Fig. 2⇑, b and c). While zVADfmk reduced FasL-induced JNK activation in SKW6 cells efficiently, it repeatedly failed to do so in CEM cells, even when lower doses of cross-linked FasL were applied (25 and 50 ng/ml) and when the dosage of the caspase inhibitor was increased up to 300 μM (Fig. 2⇑d and data not shown). Increased expression levels of the Fas-signaling components FADD, pro-caspase-8, or pro-caspase-3 or decreased zVADfmk uptake did not account for the reduced ability of zVADfmk to inhibit JNK activation in CEM cells. Comparison of FADD, pro-caspase-8, and pro-caspase-3 revealed that all three proteins are expressed at comparable levels in CEM and SKW6 cells (Fig. 2⇑e). Moreover, the amount of zVADfmk permeating the cell membrane was sufficient to prevent FasL-mediated processing of pro-caspase-3 in both cell types, but failed to block FasL-mediated JNK activity in CEM cells (Fig. 2⇑, d and f). In CEM and SKW6 cells VP-16-mediated JNK activation was also unaffected by zVADfmk even at concentrations of up to 300 μM, and expression of CrmA also had no impact (Fig. 2⇑g and data not shown). Consistent with previous reports (39, 42), CrmA expression drastically reduced FasL-induced, but not VP-16-induced, apoptosis, while zVADfmk inhibited both FasL- as well as VP-16-induced apoptosis in CEM (Fig. 3⇓a) or SKW6 (Fig. 3⇓b) cells. These observations indicate that FasL-induced JNK activation can occur in a caspase-dependent and caspase-independent manner, whereas VP-16 treatment can induce JNK in the absence of caspase activity. Caspase inhibition by zVADfmk prevents FasL- and VP-16-induced apoptosis. The viability of zVADfmk (100 μM)-pretreated parental or CrmA-expressing CEM cells (a) and zVADfmk-pretreated parental or CrmA-expressing SKW6 cells (b) was determined by propidium iodide staining and flow cytometric analysis after 6 and 24 h of culture with cross-linked FasL or VP-16 (50 μg/ml). Data shown represent the arithmetic mean ± SD of three experiments and two CrmA-transfected clones. Our current understanding of Fas signaling is based almost exclusively on experiments with Abs to Fas. Since these reagents do not reliably mimic the physiological ligand, the proposed mechanisms of Fas signaling identified by using anti-Fas Abs may need re-evaluation (36). The roles of DAXX, RIP, RAIDD, and FADD in FasL-induced apoptosis were investigated in CEM, SKW6, Jurkat, and CH1 cells stably expressing dominant-interfering mutants of these signal transducers. Dominant-negative DAXX or RIP contained the regions necessary for binding to the DD in Fas, but lacked the regions required for downstream apoptosis signaling (18, 20). Dominant-negative RAIDD contained the DD with which it binds to RIP, but lacked the CARD region needed for interaction with pro-caspase-2 (21). The expression construct for FLAG-tagged dominant-negative FADD comprising aa 80–208 of human FADD has been described (36). Stably transfected clones expressing readily detectable levels of these dominant-interfering mutants (Fig. 4⇓a and data not shown) were exposed to a range of apoptotic stimuli. Dominant-negative DAXX, RIP, or RAIDD afforded no protection against membrane-bound FasL, aggregated soluble FasL, cross-linked Abs to Fas, or staurosporine in the cell types tested (Fig. 4⇓, b–d, and data not shown). Coculture with Neuro2A-FasL cells or treatment with as little as 10 ng/ml aggregated anti-Fas Abs killed most of the transfected lymphoma lines within 24 h. In contrast, FADD-DN efficiently prevented cell death induced by cross-linking of Fas (Fig. 4⇓, b–d). DAXX, RIP, and RAIDD are not essential for FasL-induced apoptosis. SKW6 cells were stably transfected with expression constructs encoding dominant-interfering mutants of DAXX (EE-tag), RIP (EE-tag), RAIDD (I-SPY-tag), and FADD (FLAG-tag) or with a control vector. a, Expression of the constructs by immunofluorescence staining and flow cytometric analysis of fixed, permeabilized cells. Control staining of parental cells is shown by the filled histograms. Cells were cocultured with Neuro2A-FasL cells (b), recombinant FasL (100 ng/ml) with anti-FLAG M2 Ab (1 μg/ml; c), or anti-Fas Ab (APO-1 1000 ng/ml) with protein A (100 ng/ml; d). Cell viability was determined after 1–4 days of culture by propidium iodide staining, annexin V binding, and flow cytometric analysis. Data shown represent the arithmetic mean ± SD of three to five independent clones of each genotype. e, Parental and DAXX-DN-expressing CEM or SKW6 cells were treated with cross-linked FasL or cross-linked APO-1 mAb, and lysates were analyzed for JNK activity as described in Fig. 1⇑a. Equal protein loading was confirmed in all cases by reprobing membranes with an Ab specific for JNK1 and JNK2. It has also been reported that DAXX-DN can inhibit Fas-mediated JNK-activation in 293 and HeLa cells (18). To investigate the role of DAXX in FasL-induced JNK activation in lymphoid cells, we analyzed JNK activation after Fas cross-linking in CEM and SKW6 cell lines stably expressing DAXX-DN. When CEM and SKW6 cells expressing DAXX-DN were challenged with cross-linked FasL or cross-linked APO-1 Ab, JNK activation occurred at rates similar to those observed in parental cells (Fig. 4⇑e). These results indicate that DAXX, RIP, and RAIDD are dispensable for Fas-transduced apoptosis in lymphoid cells and that DAXX is not required for FasL-induced JNK activation. In this study we present the first evidence that the physiological ligand for Fas, FasL, can activate the JNK signaling cascade in lymphoid cells. This is consistent with previous studies using cross-linking Abs to Fas (14, 25, 43). Interestingly, in the lymphoid cell lines, CEM and SKW6, FasL only activated JNK signaling when it was cross-linked to facilitate extensive receptor aggregation, whereas soluble FasL did not induce such a signal (Fig. 1⇑). It has previously been shown that FasL can only kill cells efficiently when cross-linked or when it is presented in its membrane-bound form (41, 44). This may indicate that FasL-induced JNK signaling only occurs when the cell death program is engaged. Alternatively, cell killing and JNK activation could be independent, but both Fas signaling cascades can only be activated by extensive receptor aggregation. The Fas apoptosis signaling pathway requires recruitment of the adapter protein FADD and autocatalytic activation of caspase-8 (45). Caspase-8, the most upstream caspase in death receptor signaling, can be inhibited by the cowpox virus protein CrmA, and like most other known caspases it is sensitive to the tripeptide inhibitor zVADfmk (45, 46). Consistent with previous reports (36, 39), both inhibitors significantly reduced FasL-induced apoptosis in CEM and SKW6 cells (Fig. 3⇑). In contrast, and as expected, only zVADfmk inhibited VP-16-induced apoptosis because this cell death pathway requires CrmA-insensitive caspases such as caspase-9 (47, 48). CrmA reduced FasL-induced activation of JNK signaling in CEM and SKW6 cells, but inhibition was incomplete (Fig. 2⇑ and data not shown). Although zVADfmk reduced FasL-induced JNK activation in SKW6 cells, it did so poorly in FasL-treated CEM cells even when lower doses of FasL and higher zVADfmk concentrations were used (Fig. 2⇑). This difference was not caused by either higher expression levels of FADD, pro-caspase-8, or pro-caspase-3 or reduced drug uptake in CEM cells. All three Fas-signaling components were expressed at similar amounts, and zVADfmk blocked caspase-3 processing in CEM cells as efficiently as in SKW6 cells (Fig. 2⇑, e and f). In addition, caspase inhibition by zVADfmk had no impact on VP-16-mediated JNK activation (Fig. 2⇑ and data not shown). These observations indicate that FasL can engage caspase-dependent as well as caspase-independent pathways leading to JNK activation, and it is possible that different cell types preferentially activate one or the other pathway in response to FasL. In this context it is interesting to note that caspase-8 was shown to be able to activate JNK independent of its enzymatic activity via interaction with TRAFs and subsequent activation of MEKK1. However, this study is only based on overexpression analysis and lacks proof that this interaction can also occur when all components are present at physiological levels (10). Nevertheless, it is possible that Fas-mediated JNK activation is not only a stress response of the insulted cell, but, under certain circumstances, may be an active signaling event. This is also supported by the fact that JNK signaling seems to occur exclusively upstream of and/or independent of caspases in VP-16-treated lymphocytes (Fig. 2⇑). Fas ligation-induced JNK activation was reported to occur upstream of caspase activation via the intracellular protein DAXX. DAXX originally was identified in a yeast two-hybrid screen and was shown to bind to Fas and signal to the JNK cascade via the apoptosis signal-regulating kinase, ASK1 (18, 19). However, in our analysis of several lymphoid cell lines, expression of a dominant-interfering mutant of DAXX had no impact on FasL-induced JNK activation and apoptosis (Fig. 4⇑). This demonstrates that DAXX plays no physiological role in FasL-mediated JNK signaling and apoptosis, at least in lymphoid cells. Although expression of DAXX-DN was confirmed by FACS analysis and immunoblotting, it cannot be excluded that higher levels of expression might have had an effect. It is, however, interesting to note that DAXX was shown to reside exclusively in the nucleus and to interact with CENP-C, a centromere binding protein, and the transcription factor Pax3 (49, 50). Most convincingly, mice lacking DAXX die in utero due to abnormally increased apoptosis in critical organs, and cells from these embryos are normally sensitive to treatment with anti-Fas Abs (51). Collectively, these results suggest that DAXX plays no essential role in controlling Fas-mediated apoptosis. Considering the high rates of apoptosis in DAXX−/− embryonic tissues, an anti-apoptotic role for DAXX in other apoptosis pathways appears likely. 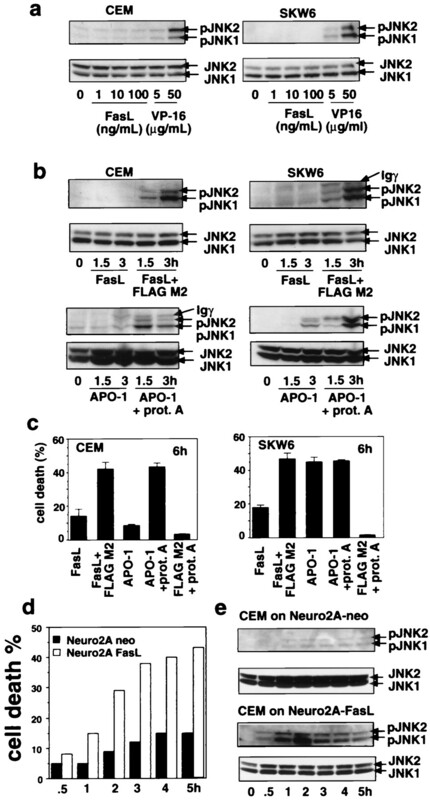 Since at least some FasL-induced JNK signaling occurs independent of caspase activity, it appears that it is not simply a consequence of apoptosis, but may have another function. It even appears possible that it might confer a protective signal. In the case of TNF-R1 signaling, the death-inducing property of the receptor was genetically separated from its ability to activate JNK and NF-κB (11). Cells lacking the TNF-R1 downstream effector TRAF2 were hypersensitive to TNF-induced apoptosis and unable to activate the JNK pathway, demonstrating that JNK activity is dispensable for death receptor-mediated apoptosis (23). Studies with lymphocytes lacking the adapter protein FADD demonstrated that this adapter is not only required for death receptor-induced apoptosis, but is also essential for the transmission of mitogen-induced proliferative signals (40, 53). Perhaps, if all death receptor pathways to apoptosis are blocked, for instance by molecules such as cellular FLICE-inhibitory protein (cFIP) (54), JNK together with NF-κB could contribute to cell proliferation or cell differentiation. We thank Drs. S. Nagata, V. Dixit, P. Leder, P. Krammer, R. Anderson, and D. Baltimore for gifts of Abs, expression vectors, and cDNA constructs. We are grateful to Drs. D. Vaux, A. Harris, J. Adams, and S. Cory for insightful discussions and critical review of the manuscript. ↵1 A.V. was supported by a postdoctoral fellowship from the Austrian Science Fund. D.C.S.H. is a Special Fellow of the Leukemia Society of America. A.S. is a Scholar of the Leukemia Society of America and recipient of a Clinical Investigator Award from the Cancer Research Institute. This work was supported by the Dr Josef Steiner Cancer Foundation, the National Health and Medical Research Council, and the Swiss National Science Foundation. ↵3 Abbreviations used in this paper: MAPK, mitogen-activated kinase; FasL, Fas (APO-1/CD95) ligand; JNK, c-Jun N-terminal kinase; MEKK1, JNK kinase kinase; TNF-R1, TNF receptor 1; ASK, apoptotic signal-regulating kinase; DN, dominant negative; DD, death domain; CARD, caspase recruitment domain; AICD, activation-induced cell death; wt, wild type; CrmA, cytokine response modifier A; TRAF-2, TNF-receptor associated factor 2; DAXX, death domain associated protein; RIP, receptor interacting protein; RAIDD, RIP-associated ICH-1/CED-3-homologous protein with a death domain.